The last couple of weeks have been a bit hard. I have been going to Swedish class each morning, and doing my Swedish homework in the afternoons, but apart from that, my motivation levels have been quite low and I have felt completely exhausted. This might have something to do with the fact that we currently have about 2.5 hours of sunlight per day, and even this has been thwarted by heavy cloud cover and rain. When I moved to Sweden in January I was not bothered at all by the darkness, and I enjoy winter normally, so I have no idea what the problem has been lately. I bought a cute Swedish Christmas light to brighten up the apartment. 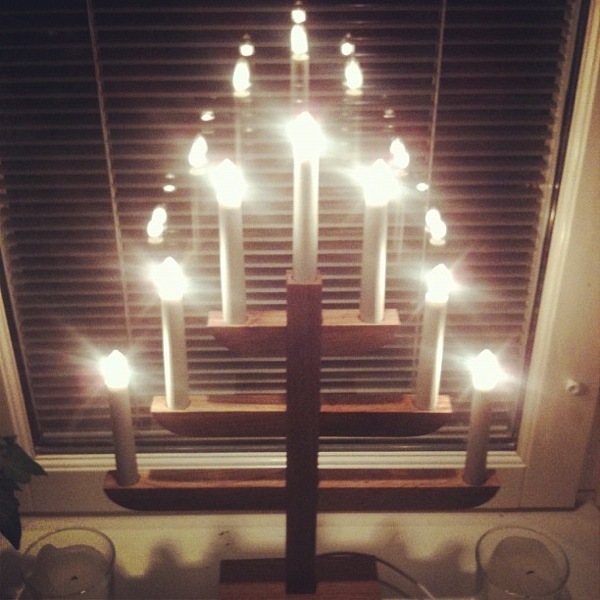 If you are in Sweden at Christmas time, you will see little arrows of light in almost every window from one of these. Miraculously, over the last couple of days I have began to get my enthusiasm back. I have done more things this week, than I have in the last two weeks combined, and it feels really good. I am starting to work out what I need to focus on next year to be able to get where I want to get – career wise and so on. Now that I have a personnummer I am able to apply to take the Swedish for academics course next year, which is an intensive course broken down by study specialisations, run by the Swedish government – with the added bonus of being free. I need to submit more proof of my past studies than I do for any of the PhD applications I am working on, but I think it will be worth it if I am accepted. I also had a great day today catching up with an old friend from Melbourne who stopped by Sweden on his way to moving to Seattle. We walked for hours all over Stockholm, visited Skansen and relaxed in cafes. The sun even came out – Jerome must have brought it with him from Australia. My main excitement this week is that Geoff and I are off to Nuremberg in Germany tomorrow, and I can’t wait. This will combine many of my favourite things, Christmas markets, world war two history, and of course, spending time with Geoff. We will also be visiting Prague for a few days as well, and I am sure it will be amazing. So god jul, and have a wonderful Christmas time, be it in sunny Australia or in (hopefully) snowy Europe – and everywhere in between!